Have you been numbering? organizing? pitching? sorting? cleaning? labeling? measuring? gluing? taping? cutting? or color-coding? these last few weeks, days, and hours before school starts? If so, you are not alone. I think the entire teacher-community has been organizing baskets, lockers, files, papers, books, and even craft material this past month. I think we should have a "special" day. You know. . . There is Grandparent's Day, Groundhog's Day, Boss Day, Teacher Appreciation, but we need an "Over Organization and OCD Day". I think I actually heard you hysterically laughing out loud on that one. So with that said, I present to you . . . 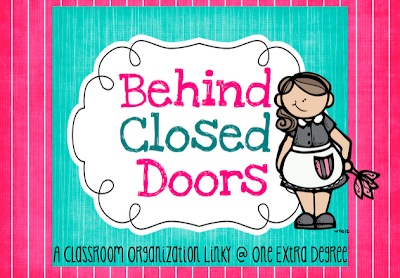 I have linked up with One Extra Degree to show some of our "Best Organizational Tips"! 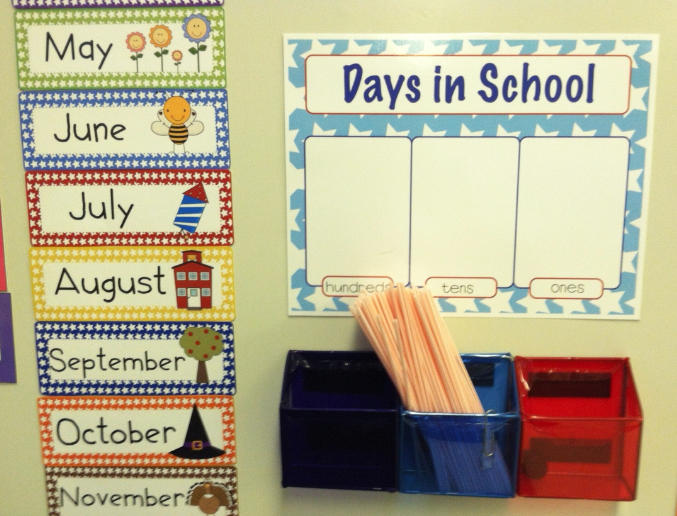 Here are some pictures from my colleague, Stephany's first grade classroom. 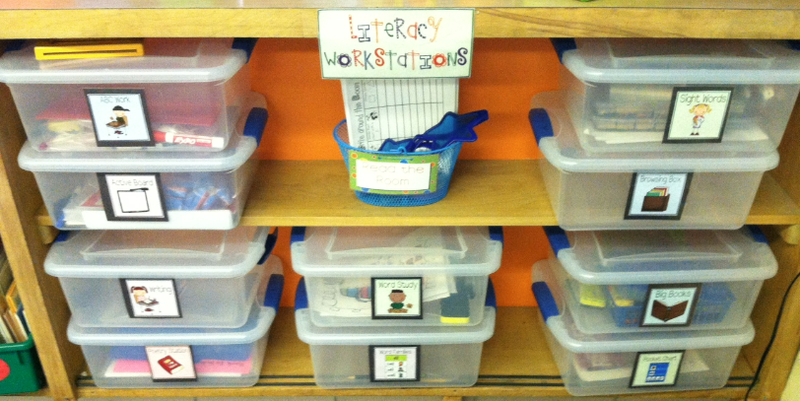 She is extremely organized and dedicated to her classroom. If you see an idea that you like, feel free to "pin" from our site or link back to your blog. I know that I have showed this picture before, but I think it is pretty handy. This is a jewelry organizer. It is two-sided so I put magnetic letters organized according to the alphabet on one side (shown in picture) and letter tiles on the other side. I hang it from my "roll cart" because space is limited and for easy accessibility. 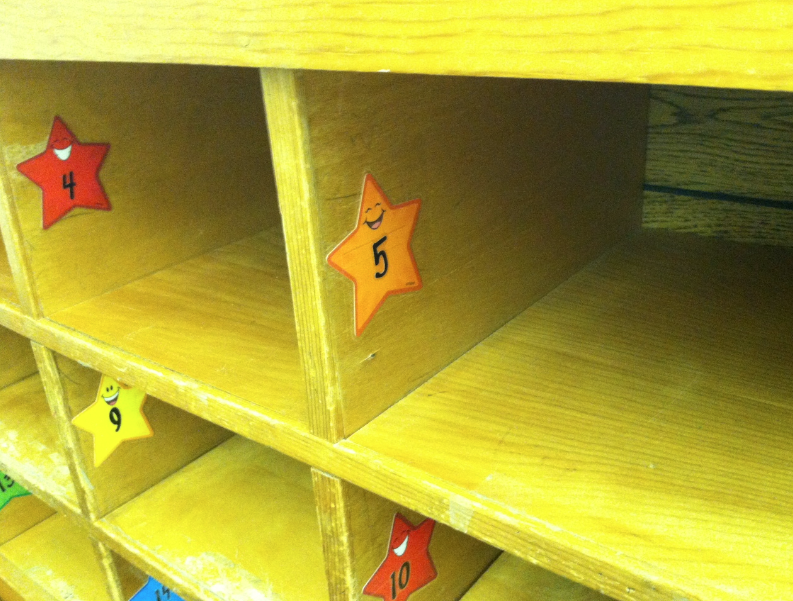 Stephany organizes her student cubbies by putting the numbers on the side. I think this is a FABULOUS idea. 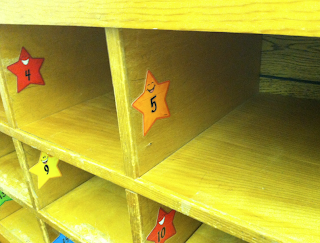 The papers, clipboards, books, and supply box don't cover the numbers. I need to remember this tip for my cubbies next year. Can you tell which is Stephany's? These have the labels on the side. Papers will not cover up the numbers. The labels are on the bottom. In both cases we are using numbers; however, next year I will move mine to the side. Here is another tip . . .
Literacy workstations are also being utilized with these containers. She purchased these from Dollar General. They fit perfectly on the shelf and are labeled for easy identification. I believe these plastic pouches were purchased from the dollar store too. 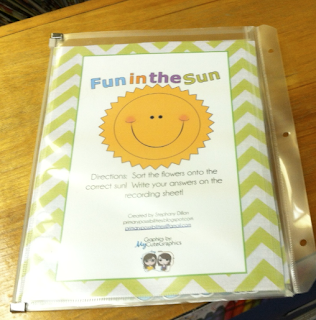 I love them because students and teacher can easily see what items are in the literacy or math game. In this case, a nonsense word fluency game is in the literacy station. How do you organize your border? This is a photo from Stephany's classroom. She puts them in clear mini-tubs purchase from a dollar store. This is one tip that I will personally be doing. I have a lot yet to do this summer, so this tip may wait until Christmas break. You can use them for a variety of reasons. These plastic containers were purchased at the dollar store too. I use them in my classroom for lunch choices. Stephany uses them with straws for her hundreds, tens, ones count. I think this is FABULOUS. There are many ways to organize and save money too. I think teachers are the BEST at combining the two. Link up (the icon is at the top of this post) with your best organizational tips. I think I need to go to the Dollar Store now! The border holders look perfect. 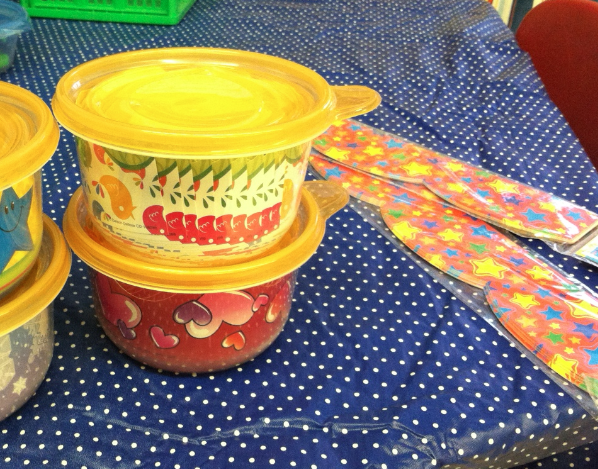 I also need new containers for my Days of School board (last year my containers weren't big enough!) and I like the pouches for the center activities. Thanks so much for sharing! I love the jewerly roll and the border ideas. I love the months of the year. Are they in one of toyr Tpt stores? What a great idea for border storage - thanks for sharing! Yes, Tammy! Stephany made that star calendar set. I am unsure if she has it up for sale, but I will check with her. If she does, I will send you the link. Thanks for the positive feedback, ladies! Keep the comments coming. We love hearing from our readers. Ooh some great tips. I particularly like the cubbie tip (duh on me for not thinking of that!) and how to organize borders. Thanks for the ideas! Thanks for the organizational tips! Your border container idea is out of this world! Also, thanks for following my blog. I am excited to start creating and sharing more ideas! Great ideas here ladies...I love the numbers on the side of the mailboxes (cubbies) I've never thought of doing it that way...Keep it Going, I'm inspired!